(CBS News) Japanese researchers have found the answer to one of life's oldest questions: "How can I get that person to shut up?" 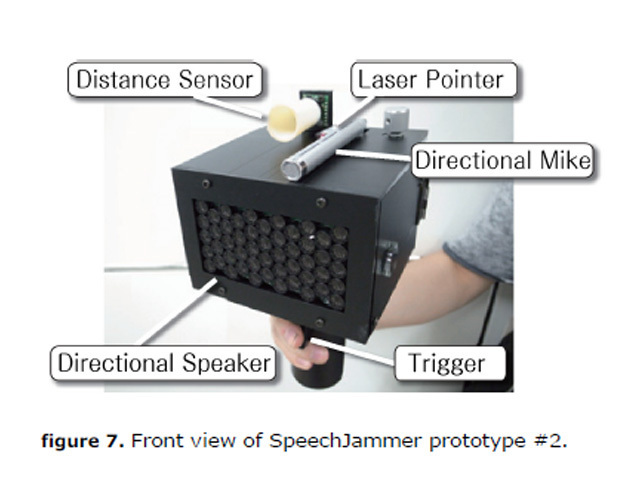 Researchers Kazutaka Kurihara and Koji Tsukada from the National Institute of Advanced Industrial Science and Technology and Ochanomizu University, respectively, published a paper with details of a gun they are calling the "SpeechJammer." The device works by "shooting" the offending voice back at the source. Users can literally aim at a target and pull the trigger. "In general, human speech is jammed by giving back to the speakers their own utterances at a delay of a few hundred milliseconds," the researchers said in the paper. "This effect can disturb people without any physical discomfort, and disappears immediately by stop speaking." By exploiting a phenomenon called Delayed Auditory Feedback (DAF), the researchers were able to trick the brain into vocal submission. The idea is that when we speak, we don't just generate sound. Our brains actually need to hear what comes out of our mouths. It's called "auditory feedback." "Our natural utterances are jammed when the auditory feedback is artificially delayed. It is thought that this delay affects some cognitive processes in our brain," the researchers said. Basically, it is nearly impossible to speak if your own words are played back to you at a delay of about "a few hundred milliseconds." The result is very similar to stuttering. Apparently, DAF can cause a "physically unimpaired" person to stutter. In an ironic twist, DAF can also help a improve stuttering. And, medical DAF devices already exist for that purpose. The researchers were able to build a working prototype. Details of their research and methodology can be found at the Cornell University Archives under the title, "SpeechJammer: A System Utilizing Artificial Speech Disturbance with Delayed Auditory Feedback."